atch out for Mind Fish. Watch out for confetti exploding in your face at live shows. Watch out for their insanely catchy songs getting stuck in your head after one listen. Watch out for their debut album, the appropriately titled WATCHOUT! In a day when many acts are letting their laptops do the work, relying on choreographers for their stage moves, and generally taking themselves quite seriously, there is something refreshing about Mind Fishs commitment to fun. 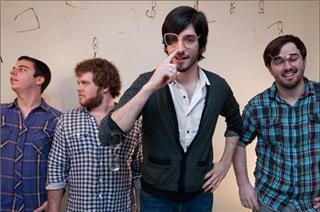 The four members (Dean Tartaglia, Dan Barbera, Trent Rissover and Steve Warstler) all contribute various instruments to the arsenal of sound, including guitar, keyboards, saxophone, ukulele, percussion, vocal harmonies, and pretty much everything but the kitchen sink - although theres always a chance that will make an appearance on the next album. This self-proclaimed Nerd Pop band might have some familiar flavors, but there is definitely a secret ingredient added, resulting in something completely unique. Its as if the band took your favorite parts of high adrenaline, oddball rock bands such as Weezer, OK Go and They Might Be Giants and actually managed to up the quirkiness quota, without ever pushing past the point of pure, joyous power pop/indie rock. Growing up in the mid-west, the foursome first admired and then grew to share the stage with many local heroes such as We Are The Fury and The Hard Lessons. They then took their finely tuned yet frantic live show on the road, touring the US relentlessly and appearing alongside bands such as Fitz and The Tantrums, The Constellations and Walk The Moon. The just released video for Cant Control At All is rapidly gaining popularity on the internet. With flashing colors, pulsing guitars, dancing band members, and a chorus beseeching you to Shake, it is hard to sit still and absolutely impossible to ignore. This summer brings a lot of exciting things to the Mind Fish universe. Dean (lead vocals, guitar, keys, sax, ukelele, percussion) will be heading on out on tour with Tenacious D. In addition, the band is writing and preparing songs for the follow-up to WATCHOUT! Mind Fish will be returning to the studio as soon as the Tenacious D tour wraps.